With rare exceptions, more officers are killed annually in vehicular accidents than by felonious assailants. But no matter how many “Move Over” laws states pass, people just don’t seem to care and continue to endanger cops through their carelessness. 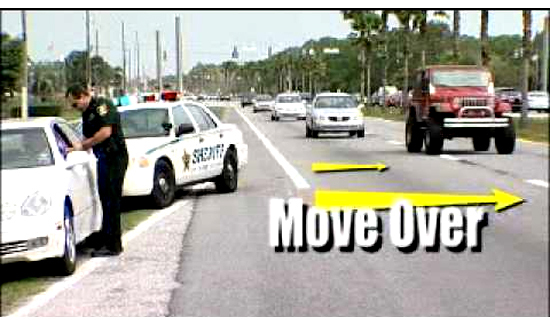 One of the easy ways to make sure people pay attention to the Move Over laws that save cops’ lives is to put some real teeth in the fines for failure to obey the law. Until then, cops should expect that some people will treat their safety as a legitimate concern but that most can’t be bothered to stop texting long enough to change lanes. For instance, since Tennessee’s Move Over law was passed in 2006, roughly 13,000 people have been cited by the Tennessee Highway Patrol. Violators face a fine of up to $500 and up to 30 days in jail. More than 150 U.S. law enforcement officers have been killed since 1999 after being struck by vehicles along America’s highways, according to the National Law Enforcement Officers Memorial Fund.